Welcome to the GT Circuit Section of the BRCA. The GT Circuit section was created in 2014 and we are a sub-section of the 1/12th Electric Circuit Section (hence the banner above) and combines three different classes: GT12, World GT10 and Formula 1. This variety should ensure there is a class to suit most drivers. From the wonderful simplicity of a GT12 that both welcomes a beginner and rewards the skill of a more experienced racer, the greater speed and complexity of a World GT10 and the beautiful scale looks of a Formula 1. The BRCA GT Circuit Section, together with the host clubs, run a professional, friendly and well organised competition that welcomes drivers of all abilities. Our national indoor series runs from January to April, so whatever the weather you can continue to enjoy racing in the warm and dry. Most of our venues provide hot and cold food and drinks. All events provide pit tables and chairs for our competitors as well as mains electricity. Our aim is to organise the best national championship in the world while giving good value for money. We hope you will come and race with us. Please do not hesitate to contact us directly if we can be of any assistance. Good luck with your racing during the forthcoming season. Chippenham Model Car Club hosted Rounds 3 & 4 of the BRCA GT12 National Series 2018. 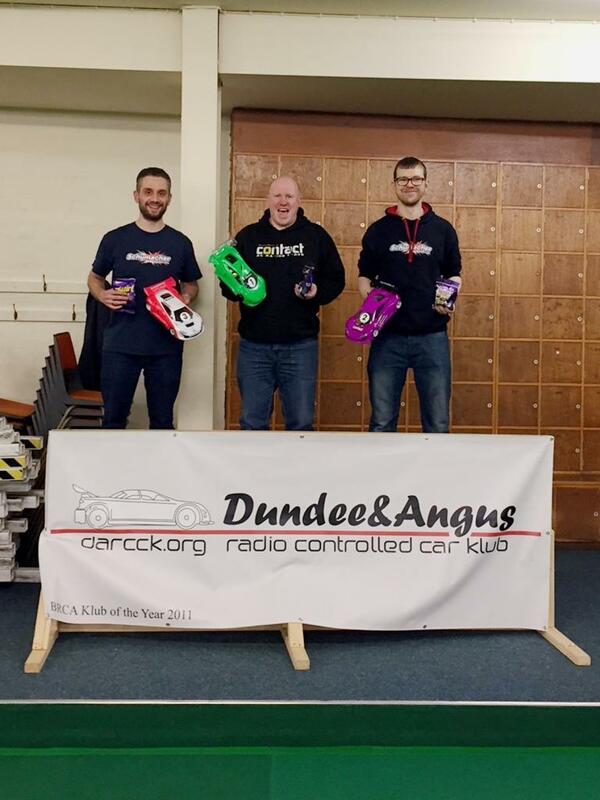 The third round of the BRCA Scottish GT12 regionals 2018 took place on Sunday 18th of March and was hosted by Dundee and Angus Radio Controlled Car Klub. This was the second visit in the series to the Dundee club and the fantastic facility that they race at. As per round 1 a flowing track layout invited the 24 racers in attendance to show what their cars could do. Eastbourne Electric Car Club hosted Rounds 1 & 2 of the BRCA GT12 National Series 2018. BRCA GT12 2018 National Entry OPEN!